It was another hot, 100% humidity day today. It rained over night but none today. Not even a scattered brief shower. The team was really starting to feel it today. 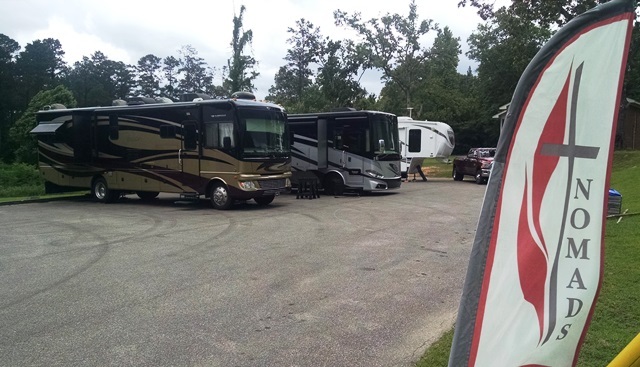 We are glad it’s NOMADS Friday and everyone has three days to get a little rest. Devotion today was by Debbi from 1 Peter 5:6-9. The key verse was 5:6. 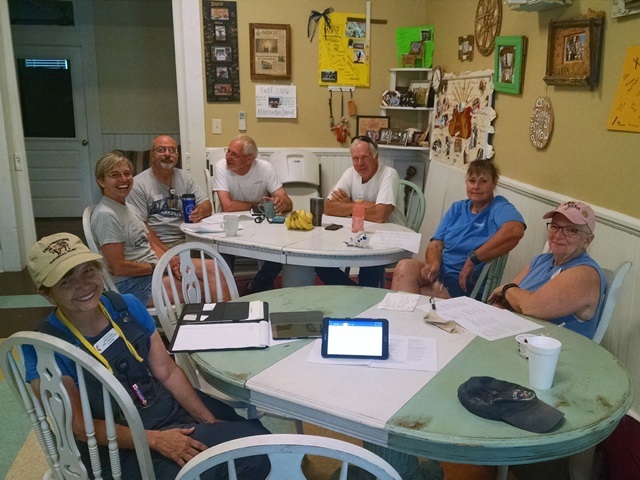 Debbi shared some experiences at her last job in relation to that verse, “Humble yourselves under the mighty power of God and at the right time He will lift you up in honor.” We had some good discussion. Thanks, Debbi, for sharing with us. It was then time to head back to James’. 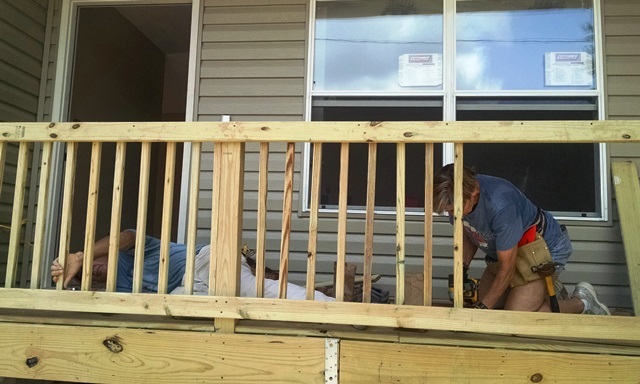 Debbi and Wayne with some intermittent help by Max continued the work on the porch railings. They completed that task this afternoon and we think it looks amazing. And so much safer! 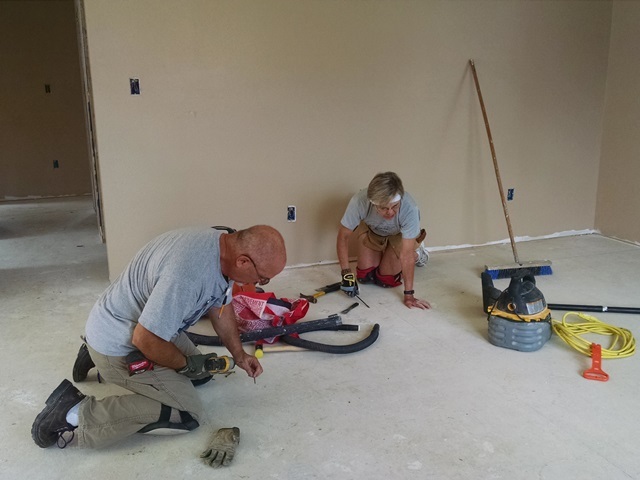 Nula and Phil worked on the closet in the second bedroom and ran in to a few complications but completed bedroom #2 shortly after lunch. 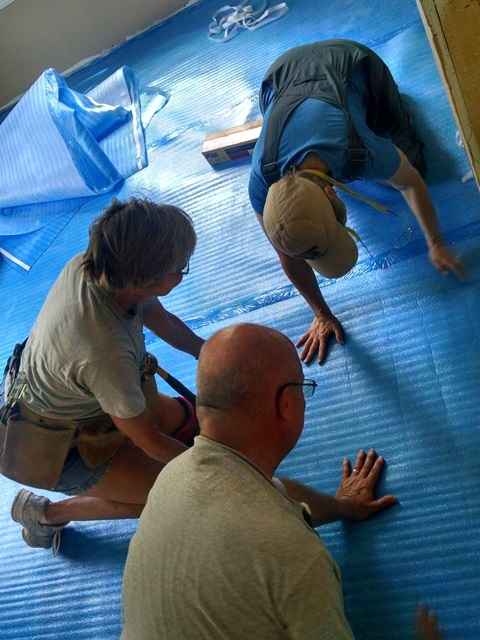 Dave, Carol and Anne worked on the living room and hall. There were several complications there as well. Keeping everything straight and square as we worked down the hall with so many doors, i.e. open space was a challenge. There were also some problems at the front door. 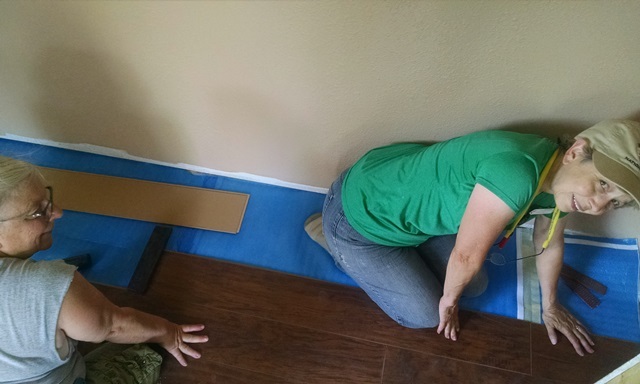 Last night’s rains left a wet spot under the door so time was spent working on that leak. Nula and Phil joined us in the living room this afternoon. We ended the day with the hall basically complete and the living room about ½ complete. 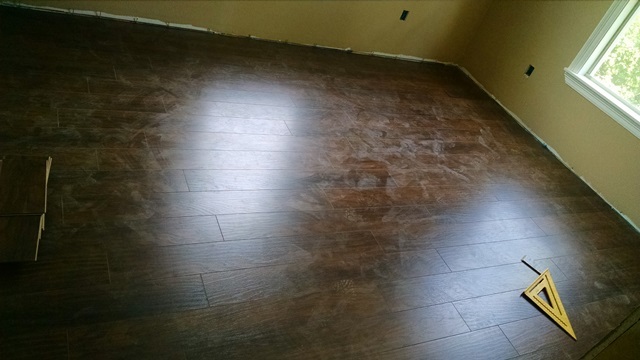 We also still have to install laminate in 3 hall closets and part of the laundry room. Hopefully Monday, after some rest, we will be able to make more progress. 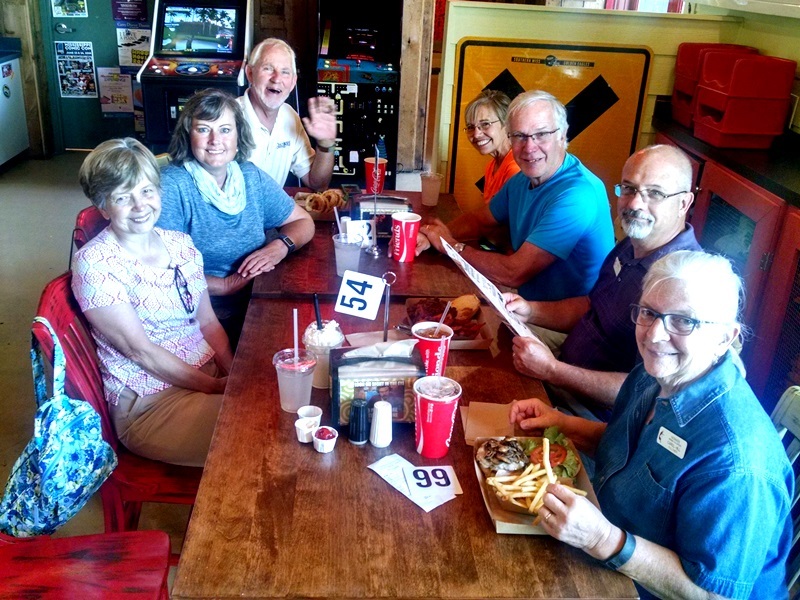 We were pleased today when our home owner, James, accepted our invitation to join us for lunch at R3SM. He seemed to really appreciate the invitation and it gave us time to get know each other better. A special time. 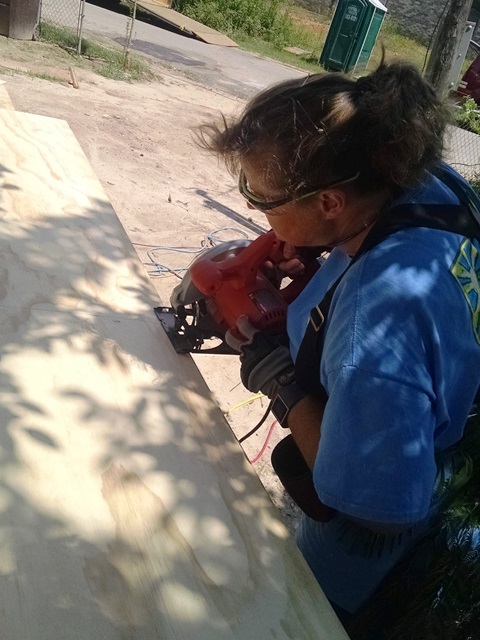 Usually we eat at the job site so if the home owner is there they can join us but since we are less than five minutes from R3SM’s air conditioned comfort with nice big clean restrooms, we go there for lunch. With the heat of this week, we all needed to rest in the cool for a while. 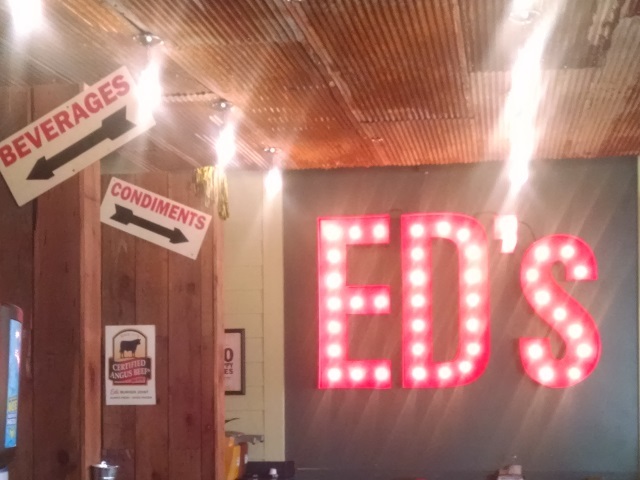 This evening the team went to Ed’s Burger Joint for dinner. Yes, we all had burgers, gourmet burgers. 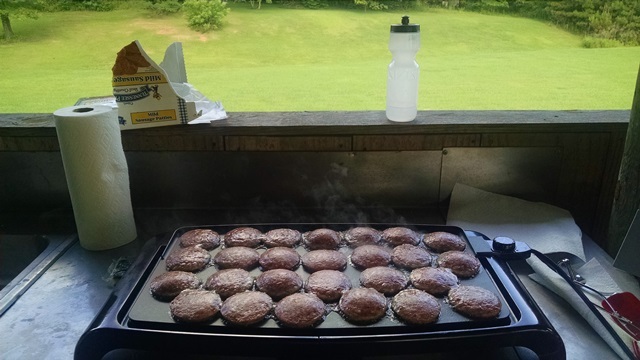 They were Angus beef burgers, minimum of two patties, with various dressings, additions. We are so glad we split ours. It was very good but also very large. We also had sweet potato fries and a milkshake. The shake was very good! Then in true NOMAD fashion, most of us went to Harbor Freight on the way home. Yep there were a few purchases made. The food was good but the fun time with our team was even better. It’s also nice to be starting our weekend. One more week to go. We had a little rain come through about 7:00 this morning but it was gone by 7:30 and that was it for the day. It was very little rain. The high today was 95 with a heat index of 100. We needed some extra water and Gatorade today. 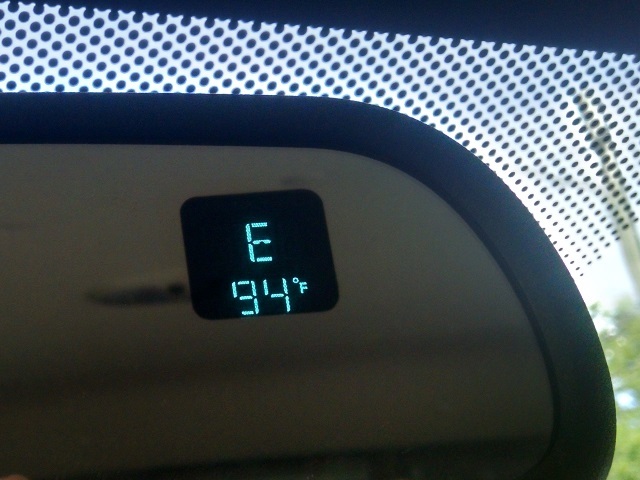 It is not even June but it is summer in southern Mississippi. Nula brought our devotion today. She began with Voice of a Savior by Mandisa, and asked us to think about the lyrics and addictions. The scripture was from Mathew 5:1-12 and 14-16, 6:1-4. She reminded us that we are the light of the world and we need to let our light shine. There was some good discussion. Thank you, Nula. Good job. 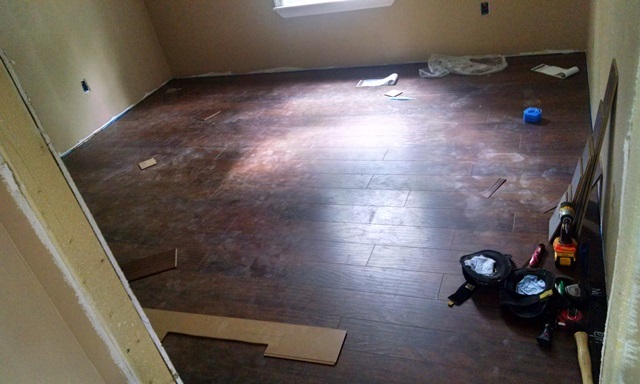 We were off to the job site and started working on the flooring again. Today, bedroom #1 closet was completed and looks really good. Bedroom #2 is complete except for the closet. 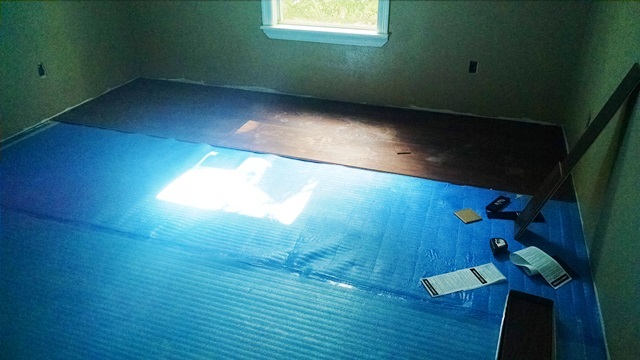 The underlayment was placed in the living room and the first three rows of laminate (the hardest) are down. It should start going faster now, although we do have to work our way down the hall and into some small closets and furnace room. 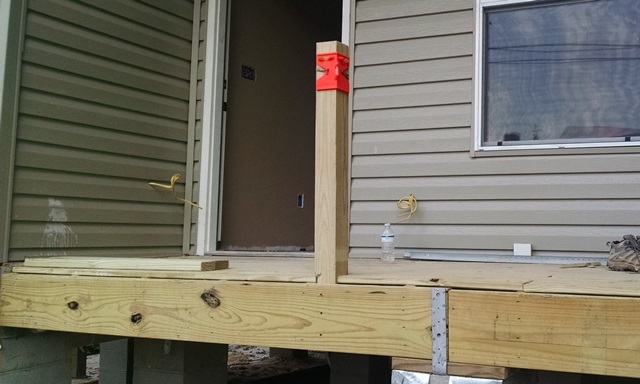 We have also started the railing for the front porch. 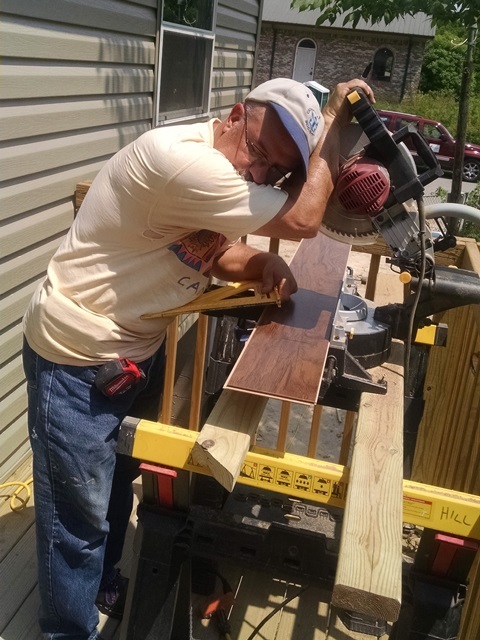 Our construction coordinator plans to deliver some doors for the bedrooms and closets so we can begin on those as well. James and his daughter came by this afternoon to see the house. They seemed pleased. 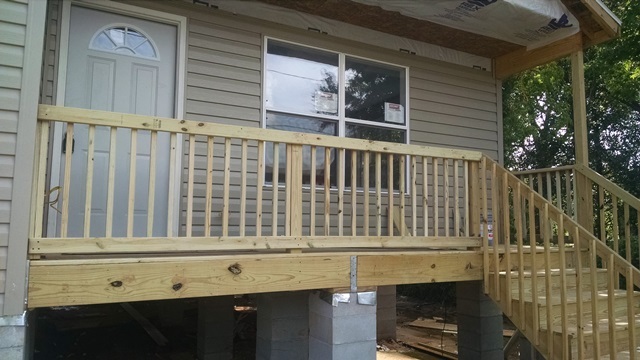 James is very anxious to move in the house but it will still be a while because R3SM still has to scheduled the electrician and plumber as is required in this area. Evidently that takes a while. 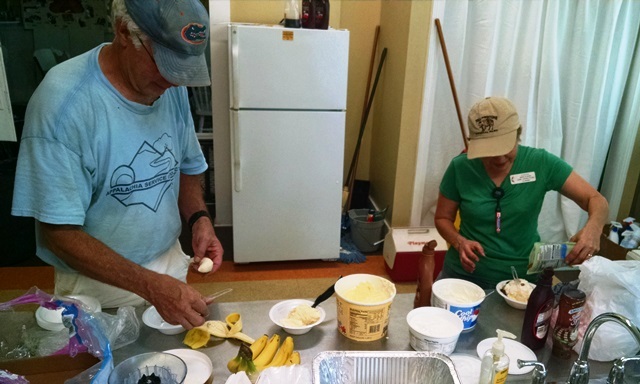 Best part of the day: When we stopped work at about 4:15, we headed back over to R3SM and made banana splits and sat around visiting with our team in the cool air conditioned dinning room. Back when we were having really pleasant weather in Baton Rouge, it was nice to say the weather was the same every day. Now once again the weather is the same every day but it’s not nearly as nice. Hot and Humid. One of the team members said their car indicated 94 when we were driving home. We didn’t look at ours. However, it’s now 7:45 and it is still 86 by our thermometer here at Oak Grove and by Weatherbug. Unfortunately, today we also did not have a breeze. Increased fluids were the order of the day. Dave and Carol had devotion today and did their usual fine job. They shared a reading by Max Lucado that everyone seemed to appreciate. 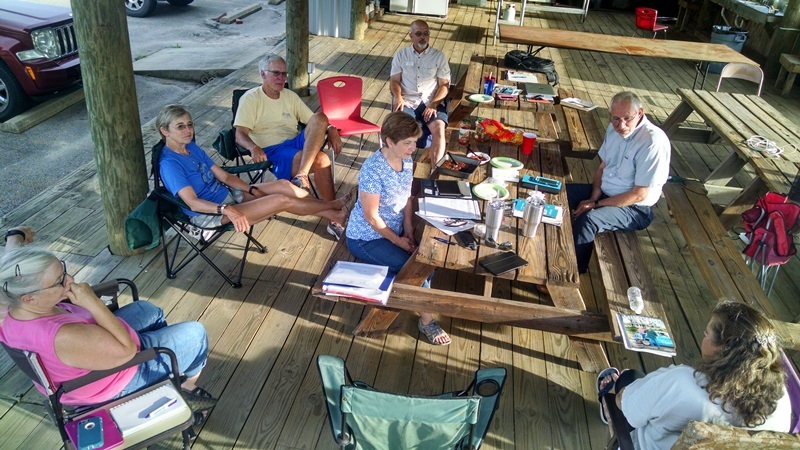 After our prayer time, we discussed work plans for the day and headed back to James’. 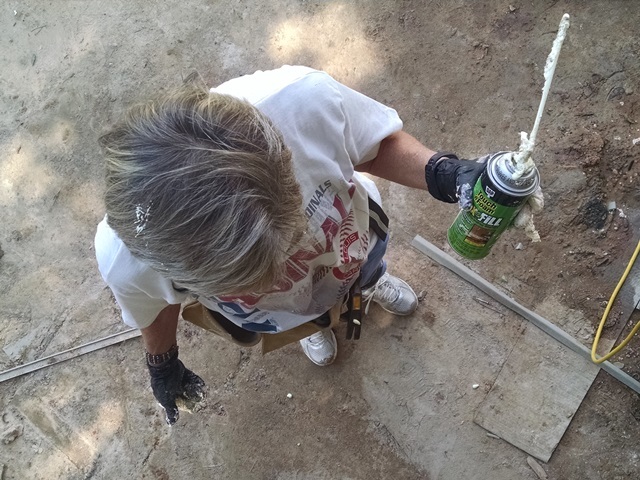 The needed supplies for the day had already been dropped off when we arrived and we all got back to work. 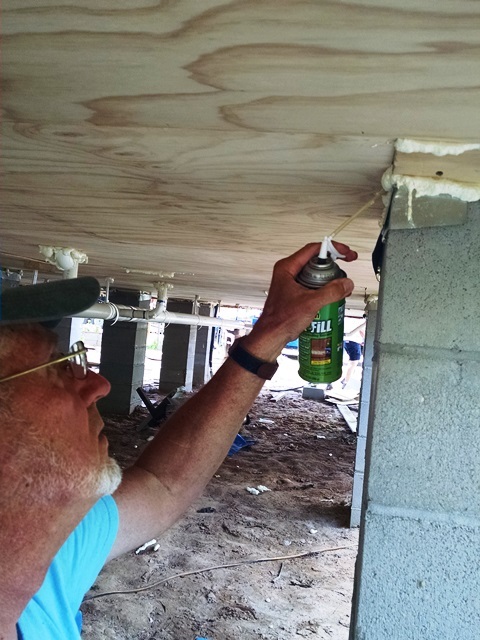 Carol, Max, Phil, and Wayne were back under the house with the help of Paul, a local volunteer. 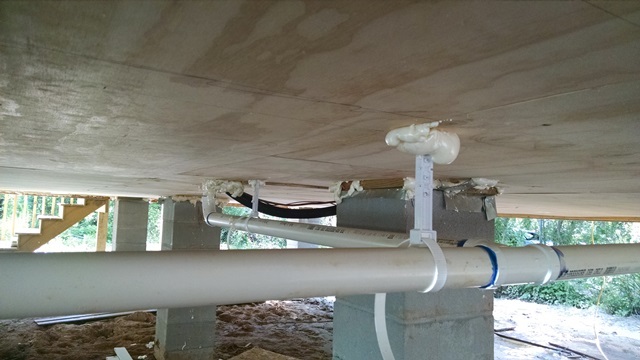 They completed the installation of the plywood and filled any small gaps with foam insulation late this afternoon. They are all glad that assignment is over. 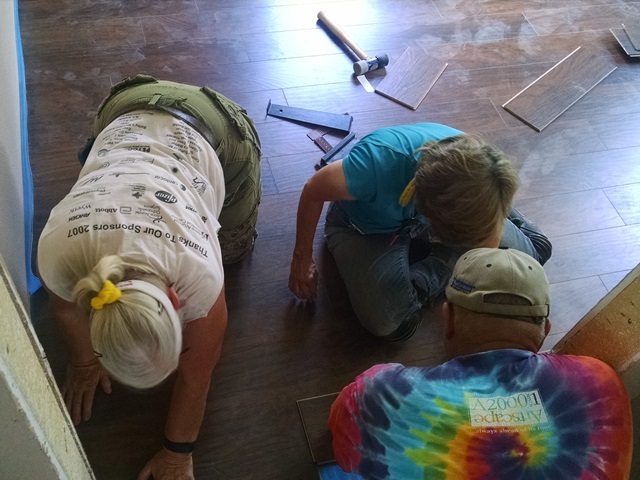 The remainder of the team, Anne, Nula, Dave and Debbi, continued work on the laminate flooring. That job is taking quite a bit longer than expected. 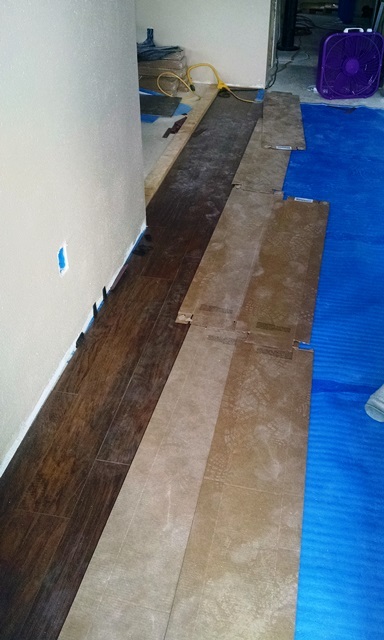 The underlayment was installed in the second bedroom and the laminate started in there. The first bedroom is completed except for the closet. 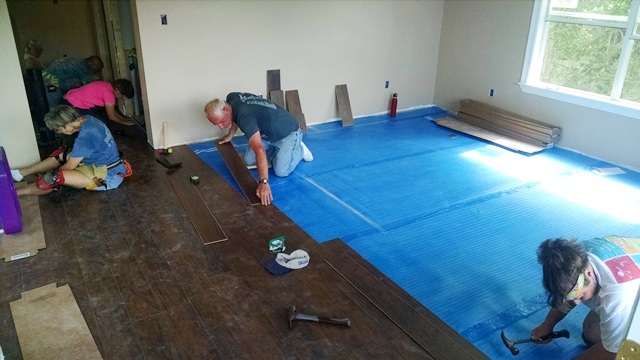 After working with this laminate for a while we have sort of determined how to successfully keep it in place but it has been a challenge. 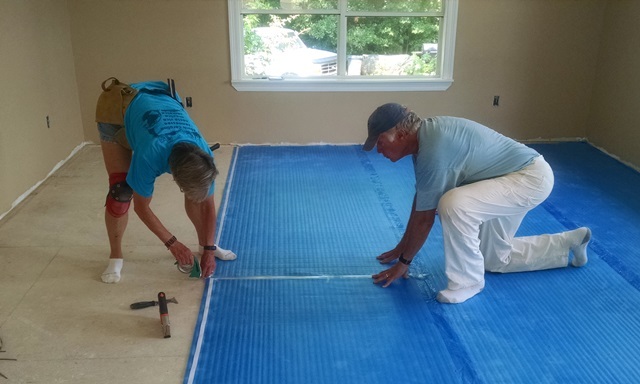 For the foam insulation, Carol and Debbi switched places. Hopefully tomorrow we will made a lot more progress since we will have a little more help. 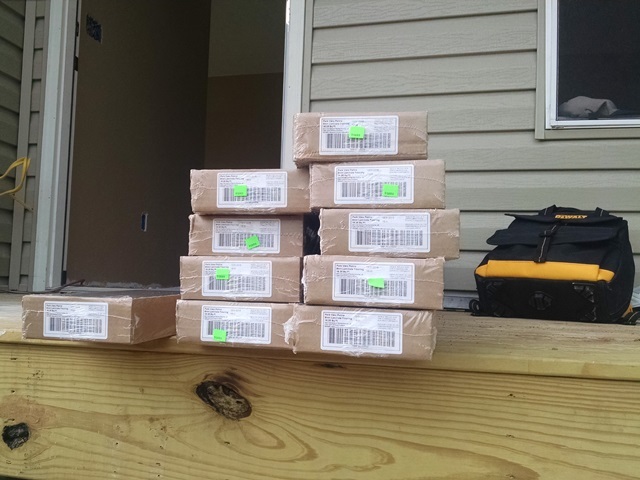 We may be sending some people to another house as well. No one was very interested in sitting out for long after we got back to the pavilion at Oak Grove. It was just too hot. Maybe we will do something different tomorrow. Today was a much nicer day than was predicted a few days ago. Our high was only 83. There was a nice breeze most of the day. The only catch was that the humidity was really high again. We also think the tropical storm winds are bringing something new in the air. We both have been sneezing, and have itchy watery eyes like we do in the spring. It all started when we walked out the door this morning. Oh well, it improved later in the day. We have had no rain today. Our thoughts and prayers are with all those in other parts of the country that are having horrible flooding. Also, we understand that it is really dry in Colorado, resulting in fires. They would really appreciate some rain. Prayers for that situation too. Max and I shared a devotion with the team this morning using 1 Chronicles 28:9. We talked about doing what God wants us to do rather than what we might want. We need to ask God to help us make his desires, our desires. After devotion we discussed the plans for the day and headed back to James’ house. 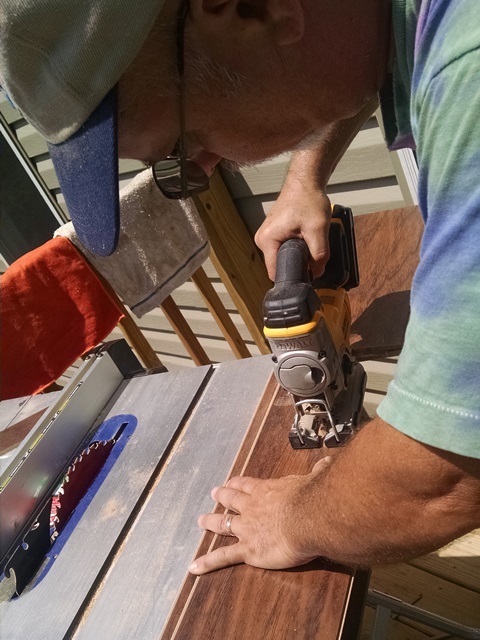 Darrell was at the house unloading the laminate when we arrived. 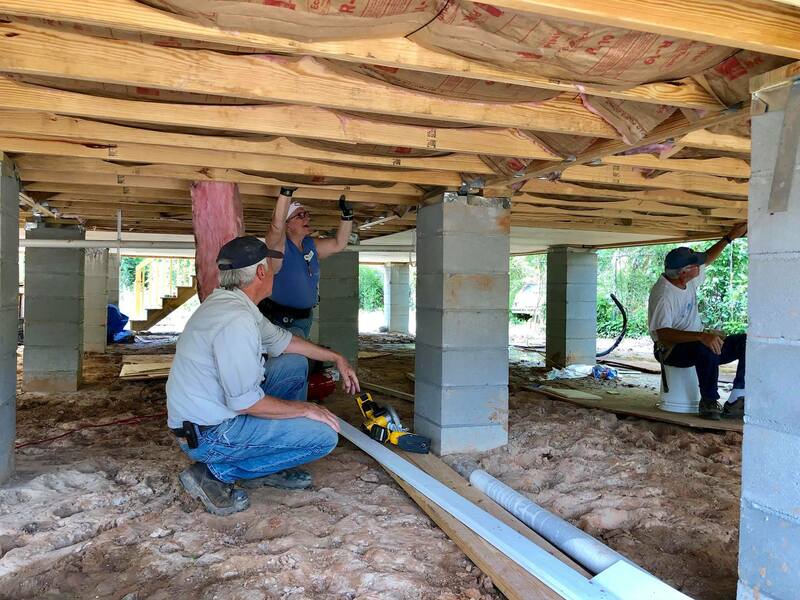 We divided into two groups, Max, Phil, Wayne, Carol and Nula worked on closing in the floor joists. Fortunately the ground under the house was considerably drier than last Thursday. It was still a hard, hot job. Everyone will be glad with that job is completed which we hope will be tomorrow. 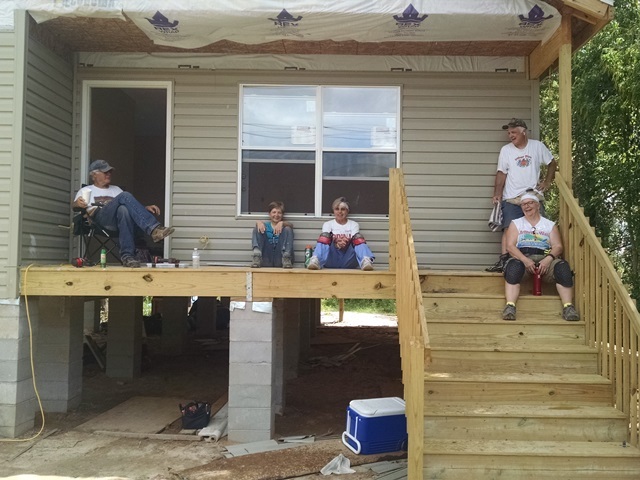 Anne, Dave, and Debbi worked inside the house. 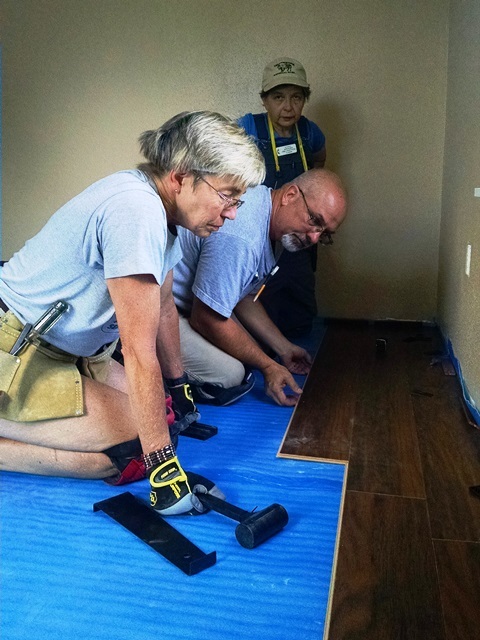 Debbi started by preparing the floors for the laminate, scraping and pounding in staples and nails. 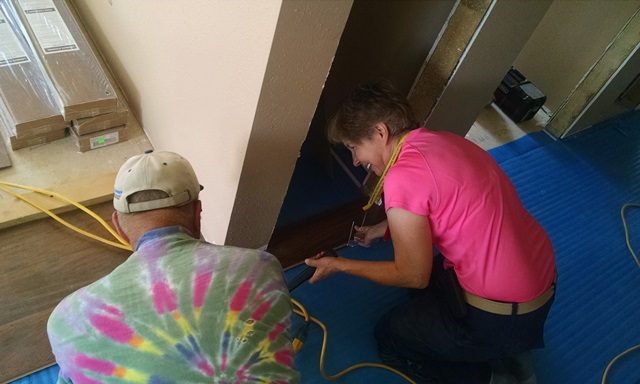 Dave and Anne worked on determining how and where to start the laminate. We decided to start in the back two bedrooms just because of all the traffic in the front door. Nula joined us later in the day and began working on the underlayment in the second bedroom. 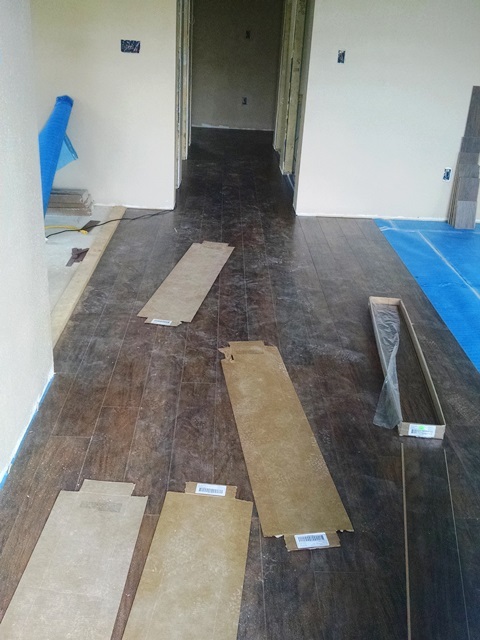 We hope all the preliminary work will pay off tomorrow and laminate will go down more quickly. It’s a very attractive laminate but it is harder to work with than some we have done. We were all tired at the end of the day. After work, a number of us sat under the pavilion and talked and got to know each other better. It was a good afternoon. Everyone stay safe and don’t forget to check on your family, friends and neighbors. Today was another sunny, humid day. The high was only 85 and we had a little breeze part of the day so not quite as bad as last week but the humidity was still 100% this morning. It’s only 77% right now. We had a good deal of rain last night but so far no rain today. They are predicting rain from the subtropical storm to come in tomorrow and Tuesday but they are now saying it won’t be as bad as they were originally thinking and it’s going further east. The team went to Sunday School today at 10:00, the same class we visited in September. Again they were very welcoming and a good class. 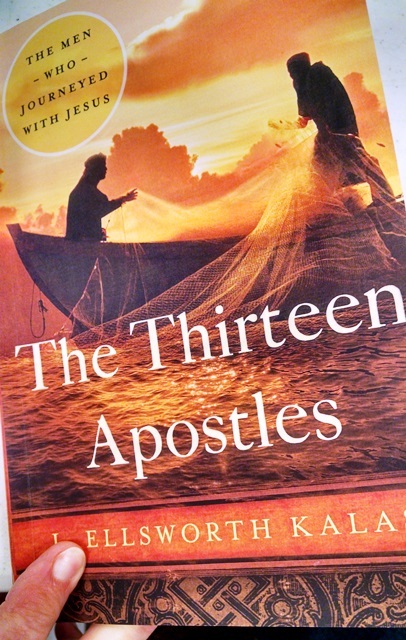 Now they are studying the book, The Thirteen Apostles by J. Ellsworth Kalas. Today’s study was on Philip, the Deliberate. Interestingly, Kalas was Carol’s and Dave’s former pastor. We then went to worship, another good service. This congregation has been so good to the NOMADS. We really appreciate them. This afternoon we joined Dave and Carol under the pavilion to share lunch and spent some time just visiting. We then had to get ready for our team meeting. Phil came in early afternoon and then later our final couple for this week, Wayne and Debbi arrived. It was nice to get to know these three new team members. 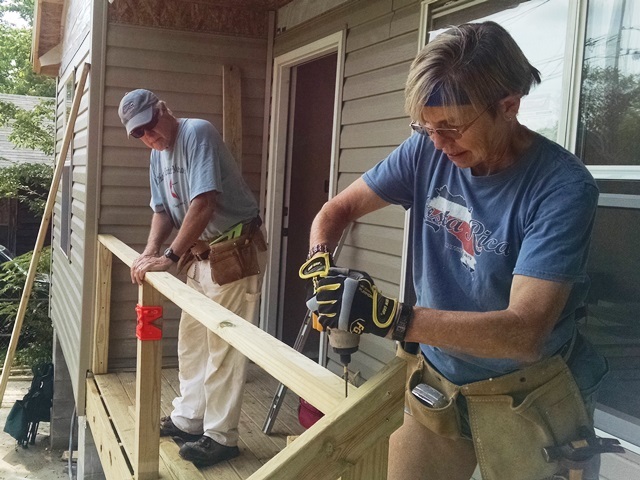 This is Wayne and Debbi’s first NOMADS project. Welcome to NOMADS. Team meeting ran a little longer than we expected but it was a good time of sharing and getting to know each other. 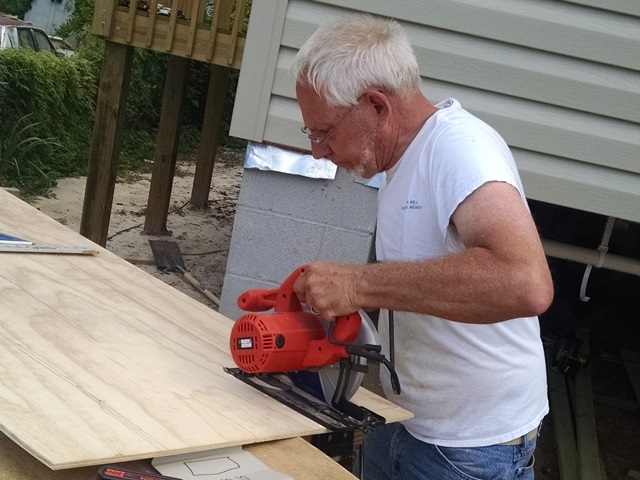 Phil was not able to bring his RV this time and is staying at the R3SM volunteer house where we have been eating lunch each day, just about 5 minutes from our job site. 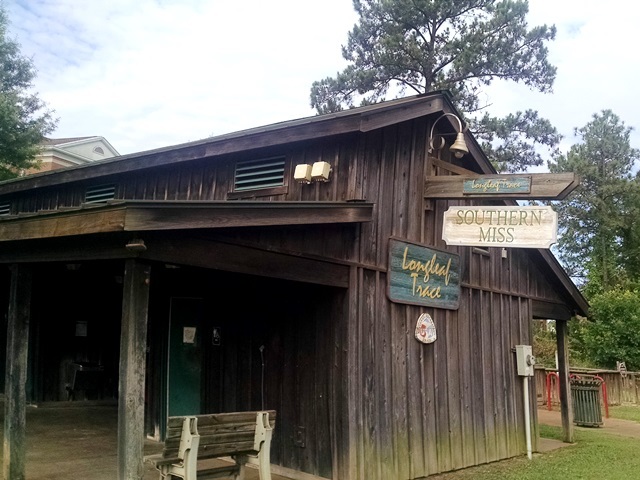 We have decided we will leave here about 7:30 in the morning and go the R3SM for devotion so Phil will not have to drive all the way to Oak Grove and then drive back across town after devotion. We will see how that works. Really think this is going to be a very good team and looking forward to getting James back in his house. Finally, a day of rest. 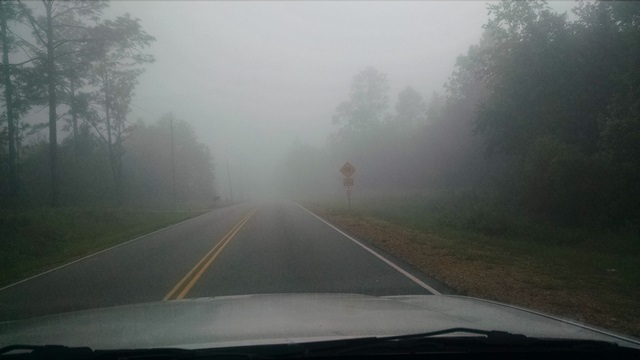 This morning started off cool – and foggy – then another hot afternoon and then rain. In fact the rain cooled the air so much we had to put on long sleeves while we were sitting out in the pavilion with the team. 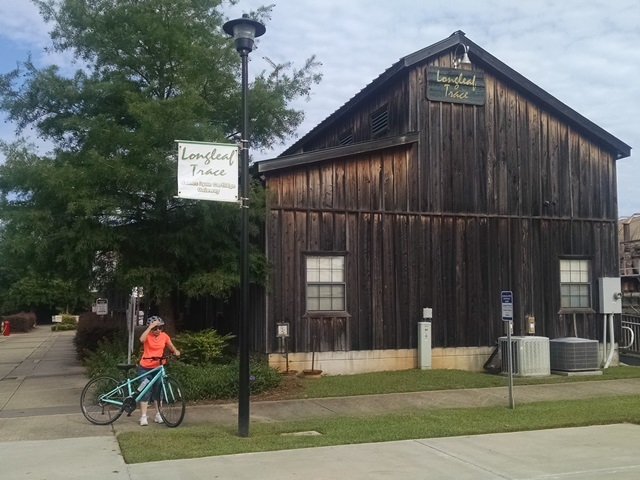 We started out day with a 16 mile bike ride on the Longleaf Trace, a wonderful rail trail here in Hattiesburg. When we were here last year we started at the Jackson Road Station and road away from town. (click here to read about it.) Today we rode into downtown. 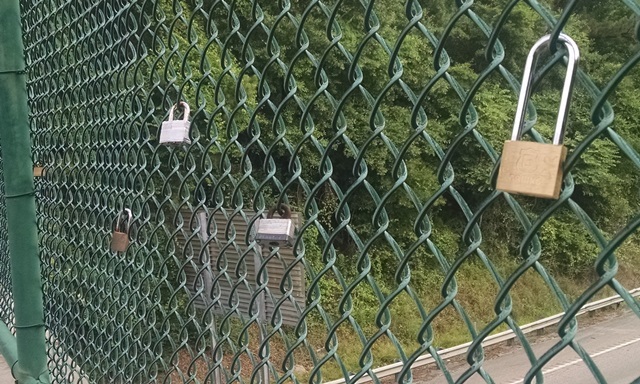 On the bridge over I-59 several someones have copied the “love locks” tradition from Paris. 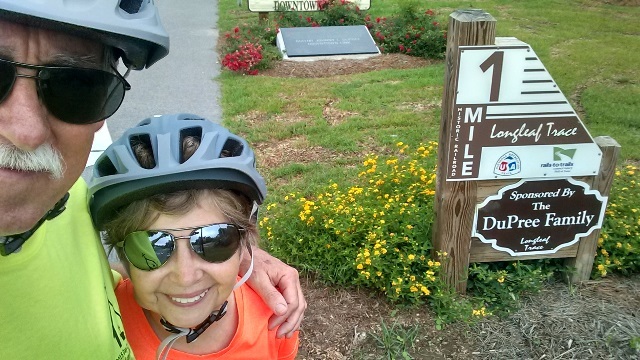 We rode past the trail gateway into downtown until we got stopped by a train and turned around. It was a fun ride and even though there were quite a few people using the trail today it did not seem crowded. 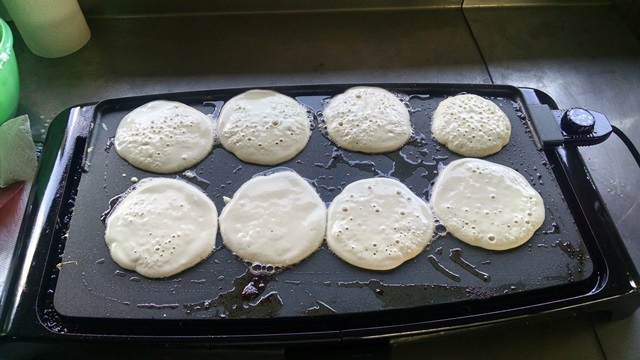 After we returned to the church we got together with the team for a pancake brunch. Max cooked up a couple of pounds of sausage patties and a pound of bacon (for future use) before we cooked pancakes and eggs. Carol brought some fresh blueberries to go on the pancakes. Great fun, but we ate too much and after we cleaned up we took naps. We got together again later in the evening to decide which service we would attend tomorrow.